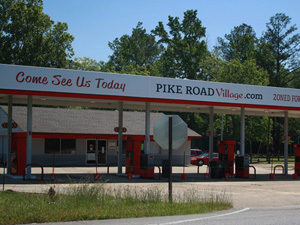 Located near the intersection of Taylor Road and Troy Hwy (Rte 231), Pike Road Village offers easy access to some of the best Montgomery has to offer. Our community is just five minutes away from shopping, dining and entertainment in the Taylor Road, EastChase and Chantilly areas of east Montgomery, not to mention I-85 for easy drives to the heart of the city and beyond. Residents enjoy lush wooded acres surrounding our safe, quiet, family oriented community. Rest easy as on-site management, maintenance, and security work together to provide you the lifestyle you deserve. In addition to on-site patrol services, a single entrance/exit point, security cameras and ample street lighting make this a safe and comfortable environment. Children board school buses at our community entrance and head to Park Crossing High School or the new Pike Road K-8 School before coming home to enjoy the green spaces beside our community Clubhouse.